Belgrade, [Montana], June 22 . I don’t have time to write but I need to. 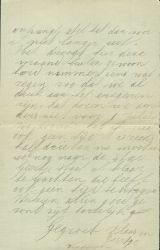 We go to Belgrade, G[eertje] and I and the children, I go to hire another farmhand who can plough for us and G[eertje] to shop. 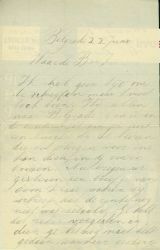 Yesterday we received a letter from uncle Klaas in which he wrote that the interest is not paid yet. You must have forgotten it and if you still didn’t do it when you get this letter, please don’t delay it any longer. This month it is extremely dry here, never even a bit of rain, so we already are busy to irrigate. Otherwise we don’t do that before July, that is why I don’t have time now. It is already half past 2 p.m. and we still have to go to town. Geertje is ready and waiting, she neither has time to write. Be hearty greeted Klaas and Geertje, children.